IFI National brings Waters of Providence (1947) back to the Foxford Woollen Mills, the very location where the film was made in 1947. 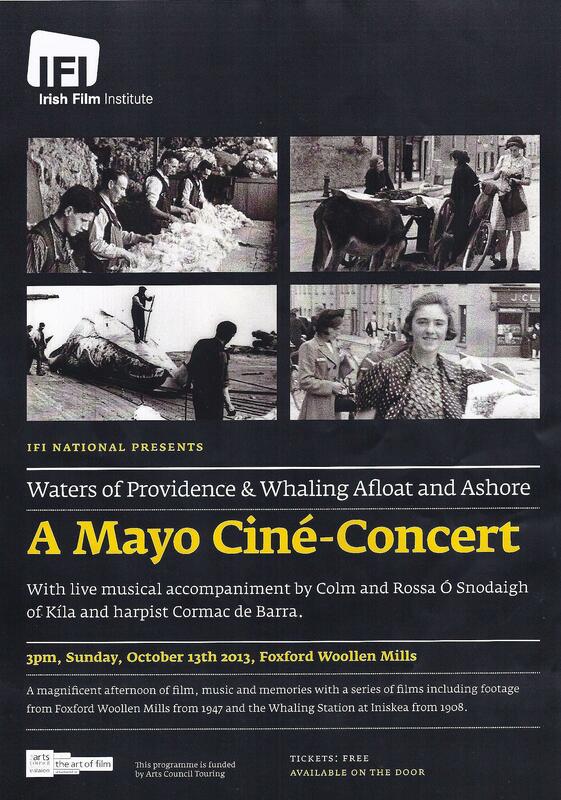 The Mayo Ciné-Concert, which also includes Whaling Afloat and Ashore made at the Iniskea Whaling Station in 1908 in a programme of silent films with live musical accompaniment. IFI National brings a programme of cinematic treasures from the IFI Irish Film Archive to Foxford for a wonderful afternoon of film, music and memories. The live musical accompaniment will be provided by Colm and Rossa Ó Snodaigh of Kíla and harpist Cormac de Barra who will use instrumental, percussive, foley and vocal elements to produce a dynamic fusion of traditional and contemporary music. The event takes place in the Foxford Woollen Mills on Sunday 13th October at 3pm.